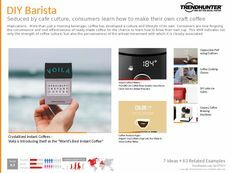 Find Better Ideas, Faster ® with a custom coffee culture trend report, our PRO Dashboard and 80+ categories of premium trend reports. 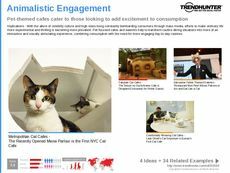 Going beyond flavors and beans, the Coffee Culture Trend Report studies the social and business aspects involved in the consumer interest in cafes and morning coffee routines. In the report we examine the role of baristas and cafe retail designs that foster an enjoyable coffee culture. Big brands like Starbucks are referenced to see how they have made a business around providing a service associated with feelings. Finally, we explore the interest in DIY brewing as well as niche cafes centered around things like board games or pets. 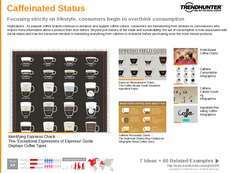 This report applies to cafe owners, baristas and executives of coffee brands. 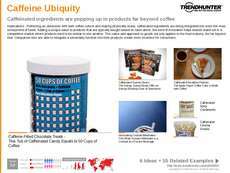 It will also help marketing agents and advertisers for coffee bean, brewing machine and cafe brands understand how to market a particular coffee culture that exists, instead of specific products and beverages. 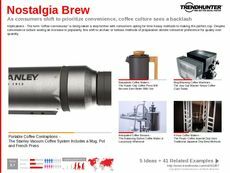 The Coffee Culture Trend Report is a beverage and retail-focused resource explaining the patterns in coffee culture and the role of sociability and nostalgia involved in marketing for cafes, caffeinated beverages and brewing systems.